A few months ago, Chris and I found a coupon for something called the BluePrint Cleanse. I’d seen the name around and had always been sort of curious about trying a juice cleanse, so we decided to give it a go. We didn’t do anything extreme, just a day, but found that the juices were really delicious and that we both felt great afterward. We also chose to schedule our cleanse for a busy day, when cooking or thinking about meals would have inevitably led to stress; it was nice to have things planned and made for us in advance. We’ve done it a couple times since, and we’ll definitely do it again. For us, it feels good to give our systems a break. We wouldn’t do it if the juices didn’t taste fantastic, though. Every last one is great. I often have a hard time deciding which is my favorite–usually it’s the one I’m currently drinking. The green juice strikes a good balance between vegetal and lightly sweet, the spicy lemonade (a nod to the Master Cleanse) is zingy and energizing, and the pineapple apple mint–Chris’ favorite–is a refreshing treat (if you have a juicer, Tracy from Shutterbean has a homemade version here). The last bottle of the day is filled with cashew milk and, after a day of light juices, the richness of it is super comforting. I personally love the cashew milk, and I look forward to it each time we cleanse. Chris, on the other hand, likes the taste of it but has a hard time with the texture. It is a little bit grainy. 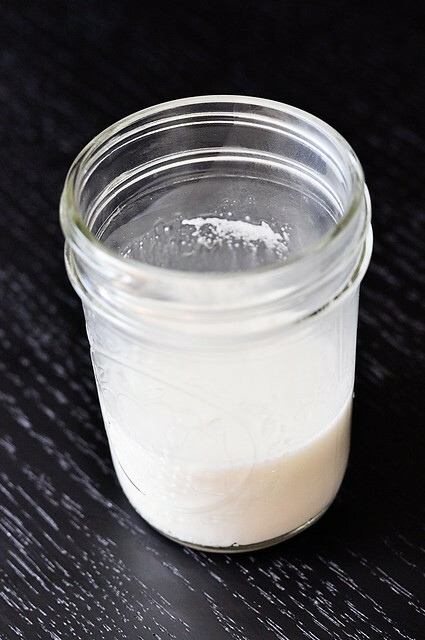 As we were drinking our cashew milk during our most recent cleanse, I said to Chris, “You know, I could probably make a version of this that would taste pretty similar and just strain it through some cheesecloth so it would be smooth.” He was on board, and that’s exactly what I did. 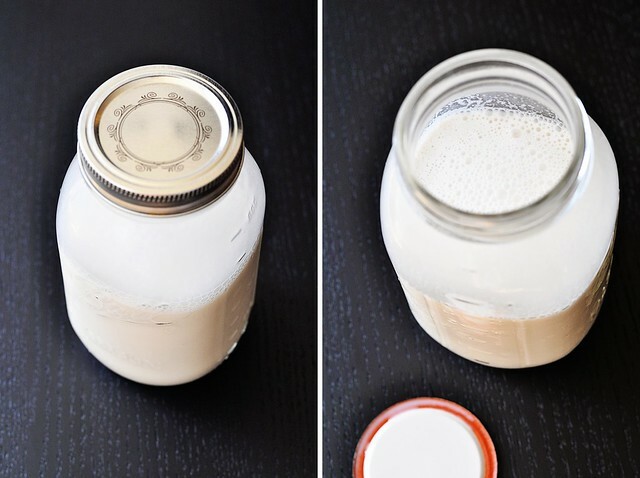 I am happy to report that this tastes just like the BPC cashew milk–a little hit of vanilla and a dash of cinnamon for warmth–but with a smooth, creamy texture. Even if you’ve never had the original, you will appreciate and enjoy this. It’s not difficult to make at all and there’s something very soothing about it. I love to have a small glass in the afternoon, to quell those midday tummy rumblings and get me through to dinner, or even as a light dessert at night. Plus, it’s raw and vegan, if those things are important to you. And just as a little disclaimer: BluePrint has no idea who I am. I’m not benefitting from mentioning them in any way. Their product is the inspiration for this recipe, however, and I want to give credit where it’s due. Also, I know a lot of people have varying opinions on cleansing and whether or not it’s a good thing. I’m not advocating juicing and I honestly don’t have any strong opinions on the subject. I just do it occasionally because it makes me feel good. You should do what makes you feel good too. I do, however, have strong opinions on this cashew milk, and I am most definitely advocating it. You should make it. Soon. I wrote the amount of sweetener in this cashew milk as variable so that you can make it to your tastes. One tablespoon produces a very faint sweetness, which may be enough for some. Since I drink it more as a treat but still like things on the less sweet side, I use about 1 1/2 tablespoons. If you know you have a sweet tooth, go for the full two. 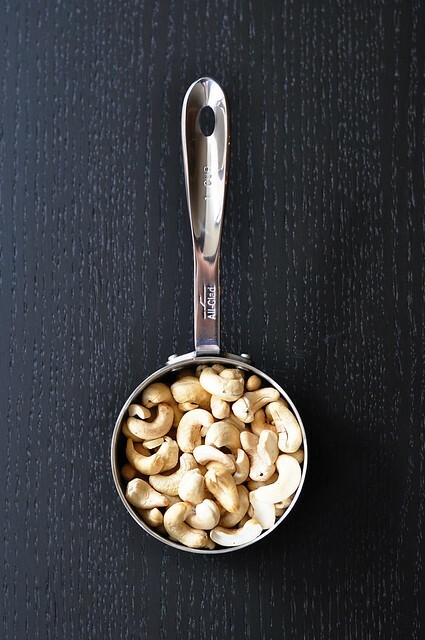 Place the cashews in a bowl and fill with water to cover. Let soak for 8 hours, or overnight. Do not leave for longer than 12 hours or the cashews may start to ferment. Drain the cashews and place in the bowl of a food processor*. Add the 3 cups of water, the agave, vanilla, cinnamon, and salt. Pulse a couple times and then let the processor run for at least five minutes. The mixture will appear creamy and white and there will be no large pieces of cashew left when it is finished. Set a fine mesh sieve lined with a double layer of cheesecloth over a bowl and strain the cashew milk. Once all the liquid has drained into the bowl, lift the cheesecloth out of the strainer with the solids, and press and squeeze the cashew pulp until it won’t give up any more liquid. Serve chilled. Store in a sealed container in the refrigerator. *If you have a high-powered blender, like a Vitamix, feel free to use that instead. You may not even need to strain the milk, but check the texture after blending to be sure. I love cashew milk as well. I like that you strained it…the texture’s always bothered me a tiny bit. I’m excited to try this variation. I’ve only ever made it plain before. Thanks for sharing! Interesting! I think I would enjoy this. Hey girl! So I looked up this BP Cleanse and REALLY want to try it… but definitely not for $200 Do you have similar recipes to any of their other juices? Thanks so much. I was definitely hooked on the Cashew Milk after doing the BP Cleanse. I used my Blendtec. It worked well and was super easy. I probably didn’t blend long enough (in a hurry in the morning) and I didn’t have cheese cloth so I just put it through a strainer. I was a little dissapointed that morning. But I think having it more chilled made a big difference. Big improvement that night. I do think if I’d blended it longer (maybe not put all the water in to start?) I’d have kept more of the nuts and not had to strain as much away and it’d be richer. I look forward to getting my hands on a vanilla bean to add a pop to it next time. And I’m going to throw some into an ice cream maker later tonight. Seems like it should be awesome. Hey Malisa! Thanks for reporting back–I’m glad you enjoyed it. Since originally writing this recipe, I have invested in a Vitamix. 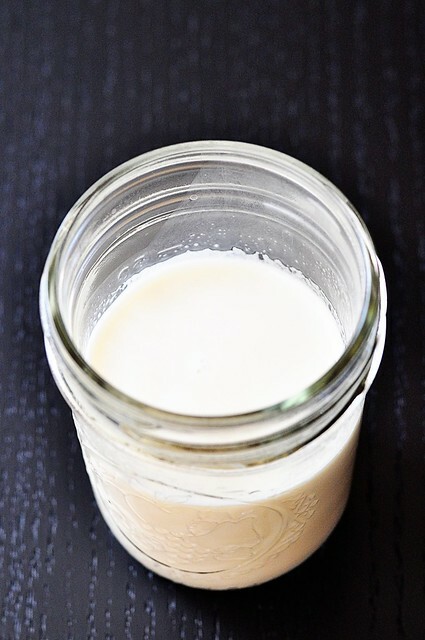 Though I haven’t made this specifically with it yet, I can attest from the other nut-based creams/milks that I’ve made that if you start with less water (just enough to make it go, really), blend until totally smooth, and then add the rest of the water, you don’t even have to strain it. So your instincts are spot-on! And yes, it is definitely one of those things that is better chilled. A vanilla bean sounds like a great addition and I’d love to hear what your results were like with the ice cream maker. OMG…thank you so much. This tastes exactly like the BPC cashew milk but doesn’t cost $10 a bottle and isn’t grainy. I made it in my Vitamix and didn’t even need to strain it. YOU ARE AWESOME!!! …also, no need to soak the cashews if using a Vitamix. Thanks again for this great recipe; you rock! I will be making this regularly. I took a vanilla stick, cut it down it’s side and scraped the little bean specks into the blender with the water as well as adding the vanilla extract. This, for me, made it taste identical to BPC. The money I save making my own is…well, a lot!!!! I wonder if you can soak the cashew in the refrigerator. That will probably prevent the fermenting process. I would use Ceylon Cinnamon powder to give it a more complex flavor without the back end bitterness of Cassia Cinnamon.